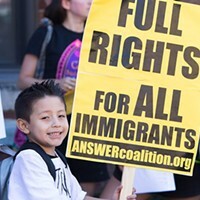 A coalition of groups will march tomorrow to celebrate and advance the rights of immigrants. The rally will take place at 5:00 p.m., at the Pittsburgh Federation of Teachers, 10 South 19th St., South Side. The group will then march to the IBEW Hall, 5 Hot Metal St., South Side. 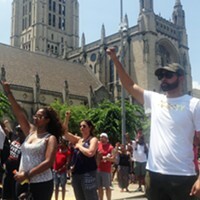 Among the groups marching will be Fight Back Pittsburgh, Ironworkers, One Pittsburgh, Metro Area Hispanic Chamber of Commerce, The Community Justice Project, SEIU Healthcare PA, SEIU Local 32BJ, United Steelworkers, Congolese Union of Pittsburgh, Working America, The Latino Family Center and the UE. "Today, the fight for workers’ rights and immigrants' rights are still one and the same," a press release announcing the march from One Pittsburgh reads. "Too many companies in our country use undocumented workers to exploit those without the rights to stand up and protest. When our co-workers and neighbors must live in the shadows, we all lose."